Deliciously prepared meal options are presented on the menu three times a day, seven days a week and features something to satisfy everyone’s palate. Our chef and kitchen staff uses fresh ingredients with savory herbs to tantalize your taste buds. Relish your meal in our beautiful, bright dining area to the sounds of soft music and good conversation. We know that taste is important too, which is why our chef works with our residents to offer the foods they crave. 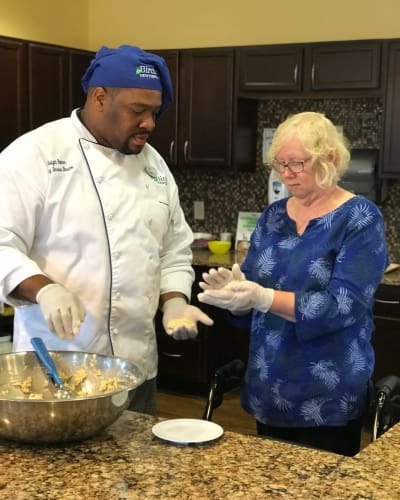 We host monthly kitchen meetings, which allow residents to participate in the upcoming meal planning to offer additions or changes to the proposed menu. The chef will even recreate your personal recipe for the whole community to enjoy. When your loved one sits down in one of the dining areas at The Birches at Newtown, they are receiving more than just a hearty, nutritious meal. They are receiving a familiar touch, a comforting smile, and friendly conversation.